You know you're in for a real ride when you get a call from the doctor (on Christmas Day) saying they had to reintubate your child. SECOND emergency intubation - check. I bet you're starting to wonder how many times this poor child has been intubated and extubated?? Well, today marks try number 9 without the breathing tube. 9. Seriously. I could give you a play by play account for the 7 tries in between but I won't. Let's just say Ben could intubate or extubate anybody any day of the week now. But I'm getting ahead of myself. Back to the NICU on Christmas Day: After many days of being baffled by a baby the doctors finally all agreed that his issues were being caused because of his heart. Duh. Rambo showed really early on that he was not the typical child with this defect. He wasn't eating and when he was, he wasn't keeping anything down. He was constantly breathing fast, like really fast: 110 bpm was average. And he couldn't seem to do the breathing on his own. So even though most babies are bigger and older when they have this corrective surgery it became clear that Rambo needed it now. Without it he would never be able to progress. 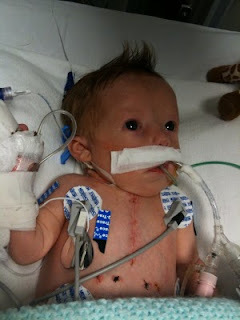 We were told on Tuesday that he would be having his first open heart surgery on Thursday. Rambo would be 2 weeks and 1 day old. And he was small. I'd like to say that I was totally prepared and ready to do this, but I wasn't. This was a big surgery. His heart would be stopped and he would be put on bypass while they made the repairs. I'm not sure I can fully describe all that I was feeling but I think the best word for it is helpless. My mind and body were not one. I was somewhat of a mess but I held it together for the most part. So his surgery is over and he's on the path to recovery. Or is he? (dramatic music) Du du duunnnnn. Amanda, you and Ben are amazing people! Y'alls faith in all this is humbling and reassuring! Your little Rambo is an amazing fighter! My prayers are with y'all! Amanda, I'm not sure if you're aware of how much you have and continue to, especially now in the midst of all of this, inspire me. I really and truly mean that with all of my heart. I Love seeing my Christian family walking by faith and not by sight. I really love you guys and you are continually in my prayers! I pray that God would just do a miracle for precious little Rambo!!! IN JESUS NAME! AMEN! Please call me anytime, if you have a spare minute, I haven't called you, because I didn't know when would be a good time.